The Guided Tracing Mode displays a large, transparent letter on a chalkboard. A bright, green star indicates where your child should begin, followed by a path of fading yellow stars. To properly print the letter, your child will follow the yellow star path, beginning with the brightest, green star. If it's necessary to lift the chalk for a new line, a new bright green star will appear indicating such. Guided Tracing Mode makes it impossible to go outside of the lines. 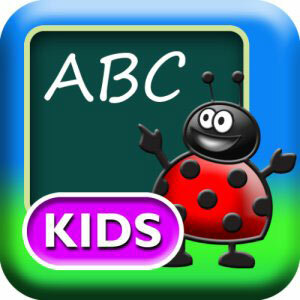 It's best for simply familiarizing your child with the letters, and providing positive feedback and encouragement. Free Style Tracing Mode offers a more organic writing experience when your child is ready for more of a challenge. While the star path is still there, the chalk line follows the exact path of your child's finger. If your little one gets sloppy, the line will turn red. Each effort is awarded one, two, or three stars. Children may also be encouraged to simply try again.